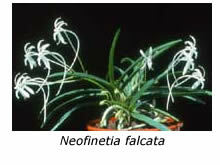 Neofinetia falcata is a charming little orchid found growing in nature in China, Japan and Korea. It was described in 1784 but was illustrated in the Japanese literature as early as 1728. It is a small, clumping vandaceous plant rarely growing higher than 120 mm, with curved leaves to 100 mm long. 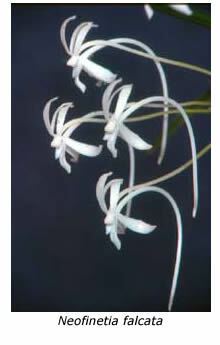 It produces short spikes that carry four to seven beautiful white flowers about 15 mm across, the most prominent feature being the long spur curving down from the base of the flower. The flowers have a perfume, which is strongest in the evening, to attract their moth pollinator. 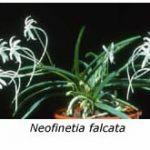 Neofinetia is a member of the subtribe Sarcanthinae and is related to Australia’s native Sarcochilus, although the white scented flower with its long spur more closely resembles those of the genus Angraecum. I purchased my plant as a small, single-growth division about 14 years ago and it has grown steadily, if slowly, since that time. In 2001 it had 17 spikes with about 90 flowers. As it always flowers in January, the challenge has been to keep the plant cool and shaded so that the flowers do not collapse prematurely on extremely hot days. One problem with a large dense plant is that the developing flower spikes can get caught up in the mass of roots and leaves, and so you need to be vigilant and disentangle any spikes before they become distorted. I grow my plant in a shallow, glazed bonsai pot using a potting mix of large pine bark, stone and chopped wine corks, topped with smaller bark and stone; the plant sits well up on its potting mix. The thick rambling roots of this species dictate a coarse mix or a rock mount, so the mix must not be too fine. The plant is watered daily during hot weather over summer, twice weekly during autumn and spring and perhaps only monthly in winter. The plant is fed with liquid fertiliser about once a month between October and April. It is grown cold, together with my native dendrobium collection, in a protected position on the east side of my shade house, which has open sides and a fibreglass roof. The common name ‘Samurai Orchid’ is derived from a connection with Japanese samurai culture. Samurai warriors apparently grew the plant as a symbol representing bravery, nobility and wealth. 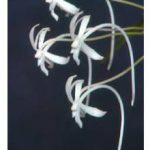 Neofinetia falcata has a long history in cultivation in Asia, and Japanese growers have developed many forms of this wonderful orchid, just as we have dozens of varieties of Dendrobium kingianum in Australia. There are tall, short and clumping forms, plants with long, short, flat, channelled or variegated leaves, and plants with white, cream, yellowish or pink flowers – even ugly tetraploid forms! Japanese growers apparently grow this species on a rock or upturned terracotta pot wrapped in Sphagnum moss. Neofinetia has been used in hybridising with other vandaceous genera including Aerides, Ascocentrum, Phalaenopsis, Renanthera, Rhyncostylis and Vanda but I don’t grow these hybrids and know nothing about them. Neofinetia falcata is a beautiful little orchid well worth a place in every orchid collection.